This is such a great follow up to my recent post about The Undertaker: Did He Ever Get Knocked Down. I had the pleasure to watch Bret Hart: The Dungeon Collection recently. 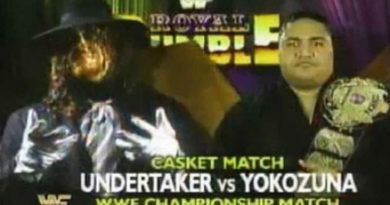 One of the matches that stood out was his first match against The Undertaker from January of 1992. This match would have been closely after the 1992 Royal Rumble because Bret Hart was no longer the Intercontinental Champion. Meanwhile, The Undertaker was becoming a big star. This was only a few short months after he became the World Champion by beating Hulk Hogan – only to later have the title stripped by then President Jack Tunney. The Undertaker was still a big imposing monster who moved so methodically; Frankenstein like. The match began with The Undertaker attacking Bret as he came back into the ring after giving a little kid his sunglasses. The Undertaker continued to dominate for several minutes before Bret was able to get a single offensive move in. Continuing with the aforementioned Undertaker article about not getting knocked down. Bret was able to land an atomic drop causing The Undertaker to stumble, almost going down. This was quickly followed by a drop kick that sent ‘Taker over the top ropes; landing on his feet, still not going down to the ground. Finally Bret was able to take him down by leaping over the top ropes onto him. This, however, was quickly followed by The Undertaker doing one of his legendary rising up from the dead into a sitting position. 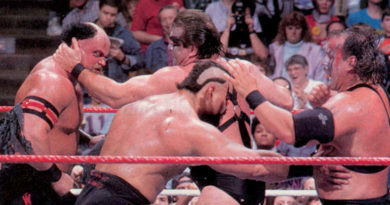 The match returned to the ring where The Undertaker continued to dominate Bret Hart. Bret, after enduring 5+ minutes of punishment from The Undertaker, is finally able to turn the tides when he reverses ‘Taker’s second attempt at walking the top ropes. The crowd begins to buzz as Hitman is finally able to mount an offensive against this unstoppable monster. Paul Bearer, seeing that his man is in trouble, distracts the referee, causing a bit of chaos. Both the referee and Paul Bearer end up getting knocked down, while the urn spills into the ring unnoticed. Unbelievably, Bret Hart is able to put ‘Taker into the sharpshooter; however, the referee is down, hurt, and being distracted by Paul Bearer. Bret breaks the sharpshooter to check on the referee allowing Undertaker to recover and pick up the falling urn. He then proceeds to knockout the Hitman with it, and pins him 1-2-3. This was a great end to this match. By Undertaker only able to win by using the urn, gave Bret Hart’s character great credibility as a future superstar. This match was definitely prior to both of these superstars becoming the huge stars they were in the mid 1990s where they had epic battles over the World Heavyweight Championship. ← The Undertaker: Did He Ever Get Knocked Down?